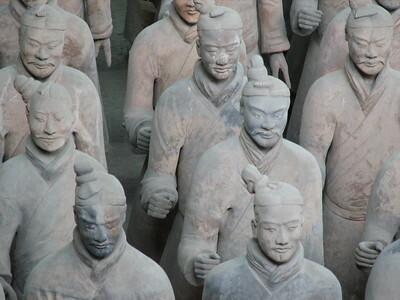 The Mausoleum of the First Qin Emperor is known for its life-size terracotta statues of warriors. They are seen as major works in the history of Chinese sculpture and valuable for the insight they provide in the social and military history of the period. This monumental archeological site was discovered by chance in 1974 by farmers. Three pits have been uncovered so far, containing over 8000 figures of warriors and horses. Qin Shi Huang, the first Emperor of China and a man fond of grand projects (the Great Wall of China also was his idea), arranged for this burial site himself. The Terracotta Army that was to be buried with him was to help him rule another empire in the afterlife. 700.000 men reportedly worked on the construction of the mausoleum for 38 years. The statues were made factory-like at the construction site. After completion, the terracotta figures were placed in the pits in precise military formation according to rank and duty. Shi Huang died in 210 B.C. and was subsequently buried here. His tomb presently remains unopened. 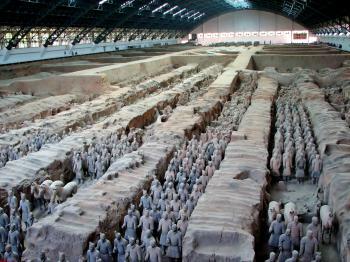 Xian's Terracotta Army belongs to the 10 or 20 most iconic sites that have been placed on the World Heritage List. Most people will have seen images of it. One can even come across some of these terracotta warriors outside of China: currently (2007-2008) a number of them are on display in a large exhibition at the British Museum in London. I saw a few myself last year in the Art Museum in Bonn, Germany. So what they look like is no surprise. To see them in their original surroundings, as the statues are left in situ, is another story. Although I had been in Xian already for a couple of days, I had deliberately chosen early Monday morning as the time of my visit: the most quiet time of the week that I could think of. And I proved to be right as I had plenty of freedom to look around and take pictures. I've read somewhere that the site can see 50.000 visitors on a busy day. For me personally, after weeks of visiting Chinese WHS as one of the few foreigners, it was remarkable to notice that western visitors almost outnumber the Chinese here. After watching the elementary explanation video, I started my round at Pit 3. This is believed to have been the army headquarters. It has only a few statues but all the features including horses. Wandering here I realized that these statues weren't found intact, a lot of them were (and are) just bits and pieces. The warriors also used to have weapons (believed to have been stolen early on) and colouring. Pit number 2 is mostly covered. At the rear there are examples of the various military ranks, like a high-ranking official, a cavalry man and a standing archer. Pit number 1 is the largest and earliest one, and that's where you can see the warriors stand in battle formation like they do in the most well-known photos. Even this pit isn't fully excavated. I loved to watch the different facial expressions of the warriors here. There are so many details to look at. The concept does resemble the Buddhist arhat hall, where statues of monks are brought together also each with their own personal expression. I ended my tour at the museum near the exit, where the two famous bronze chariots are displayed that were also found nearby. All in all a great site that has to feature on everybody's travel wish list. I visited this WHS in October 2013. I went as early as possible to the pits, yet still there were already lots of groups of tourists and locals. This meant that it was quite difficult to take photos in the central part of pit 1 but with some patience I managed to get some good close-ups, while the sun rays randomly lit some of the warriors' faces up. The sidewalks of pit 1 were much more easy to enjoy and the same applies to pits 2 and 3. The bronze chariots and the individual warriors displayed here are in great condition. Apart from the terracotta warriors, Xi'an has quite a lot to offer (neverending city walls, bell tower, drum tower, wild goose pagoda, muslim quarter, etc). The highlight of any trip to Xian, the world famous Terra Cotta Warriors are magnifient to behold. The only downside is the sites are relatively quick to "view" and then you are basically on your way. There are some sites of historical interest nearby, but nothing spectacular. Xi'an is a city of contrasts, an incredibly dynamic and beautiful history. The City Wall is enormous and a tentative world heritage site. Numerous properties inside and outside the city are now part of the "Silk Road" world heritage site. On the other hand, Xi'an is a city of rapid development (even more than many other Chinese cities), and the noise and pollution is obvious. Within the city I could not escape the sound of jackhammers or the sight of numerous cranes. Really though, a small complaint to an overall fascinating destination. The Terra Cotta soldiers are well-known and essential to any visit to Xian, but the city offers much more than meets the eyes or ears. I would also recommend the Shanxi History Museum, which is far better than the museums in Beijing. Forgotten for more than 2,000 years until accidentally rediscovered in 1974, Qin Bingmayong or famously known in English “the Qin Terracotta Army” was maybe the second most famous world heritage site of China after the Great Wall, strangely that both sites were built by the order of the same man, Qin Shi Huang, the first emperor of unified Chinese Empire. Another long bus journey from Xi’an train station, the tourist bus took me to the city of Lintong famous for its local persimmon and where Qin Bingmayong was located. After Longmen, I was not surprised to find another tourist complex welcomed me, but this one was bigger and more commercialized with American fast food shops and mini army of souvenir factories. Later I found out that there was electric car service that directly transported you to the inner gate of Qin Bingmayong skipping those entire crazy things! Qin Bingmayong was the large complex of four modern exhibition halls as the Chinese had nicely transformed this archaeological site to be a well displayed museum. The largest look liked gym building or called pit 1 was where the famous terracotta army situated, under the protective roof the image of countless rows of clay soldiers and horses were astonishing, even though I had seen many pictures of this site before, I still surprised to see the real one, and I was overwhelmed by the grand size and the realistic faces of each soldier, I just wondered how could they did this amazing thing? During my visit, Chinese archaeologists were excavating more area in pit 1; it was very nice experience to see these people in action inside such important place. For pit 2 and pit 3, there were fewer excavated statues but equally interesting especially in pit 2 where there were 5 very good condition clay statues on displays allowing to closely admiring all incredible realistic details. Another building was a museum housing two beautiful bronze chariots and weapons of the first emperor and the history of the museum. 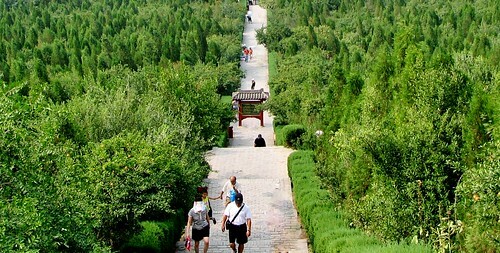 Qin Bingmayong was another great site that China offered to the list of world heritage. My second but short visit to China was happened because I would like to test my Chinese after study for a while (quite confusing after I encountered many Shannxi and Henan dialects) and it was 11 years from my last visit. China I saw a decade ago was a totally different country I had seen, this country changed dramatically and become the economic powerhouse with well infrastructure and clean toilets! I looked at the long list of world heritage in China and hoped that I have not to wait another decade to visit this fascinating country. Most people just fly into Xian, see the terra cotta soldiers and leave,for which they miss a lot. It's like seeing only the Sphinx and being finished with Egypt. Xian had been the capital of China for over 2,000 years under various rulers/kingdoms. Therefore there are a lot more to see than just the terra cotta soldiers. The Xian provincial museum (30 RMB) is well worth two hours to learn enough history to put the Mausoleum in context. A side trip on the way to the airport would be the newly (02) finished museum housing the burial items (thousands)of Han Jingdi, in which the soldiers are one-third size, along with a large group of civil servants and the entire court; farmers and farm animals, etc. This was an involuntary excavation discovered when they were building the road to airport. Give you a sense of the incredible amount of stuff yet to be uncovered. I would skip the trips to the Buddahist temples and towers (although they are 1,300 years old), unless you are into the religion, and go for the Forest of Stele. The muslim street is worth a trip even if you are squeamish about the food. The muslim population and their wares evokes the Middle East. The Terracotta Army itself is a truly wonderful site. Upon first glance the army in hall 1 appears to be interesting, but nothing amazing. After a few moments the astonishing scale of the site and the incredible detail of the work becomes clear. The longer you spend around the warriors the more impressed you become. 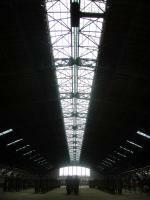 At 90 yuan the site is good value, and you won't regret the hours spent wandering around the site. The burial mound of Qin is 1.5km away and is unexcavated. 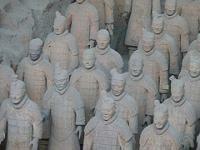 It is of limited interest compared to the Terracotta army. 4.0: Els Slots DAB Kyle Magnuson Ralf Regele Solivagant Cuban Frederik Dawson Xiao Zehuan Peter A.
Archaeological potential: "No doubt thousands of statues still remain to be unearthed at this archaeological site"
258 Community Members have visited.